Blackjack tournaments are a good chance for a gambler to prove the fact of being the best blackjack player. Blackjack tournaments provide a low house edge which means the opportunity to win more money. Blackjack tournaments are a chance to communicate with other blackjack gamblers, show and share your blackjack skills, feel the atmosphere of competition. If you are not a gambler but you are still interested in the game of blackjack, you have a good chance to observe blackjack tournaments on TV and support your favorite participant. If you are going to participate in a blackjack tournament, you should remember the fact that tournaments' rules differ a bit from traditional rules of blackjack game; so, be sure you know everything perfectly before paying the entrance fee and taking part in a tournament. 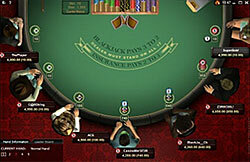 This blackjack tournament has become popular in 2006 when it made its debut on television. It was the series of Elimination Blackjack where participants gambled 30 blackjack hands, and the winner was the one who got the biggest amount of chips. Some poker players also took part in this tournament, and this fact made UBT being more interesting for the audience. World Series of Blackjack is one more TV tournament which has got its popularity in 2004: famous blackjack players and casino experts took part in this competition which attracted attention of the audience. The top prizes were quite big ($100 000 for the first season and $1 million for the fourth season); moreover, this tournament was the closed one, which meant that only invited gamblers could take part there. This tournament was very popular thanks to its interesting format: 12 people took part in King of Vegas where 6 of them were professional gamblers and other 6 - amateurs. Moreover, they had to play not only blackjack but also 8 other games: roulette, baccarat, craps, Caribbean stud poker, Pai Gow poker, Texas Hold'em, red dog and horse racing. All participants used their own strategies to beat the games and win the main prize.